Understanding budgie digestion will come in handy if your bird ever has a digestive upset... or if you want to know how they turn a seed into a little black and white dropping! 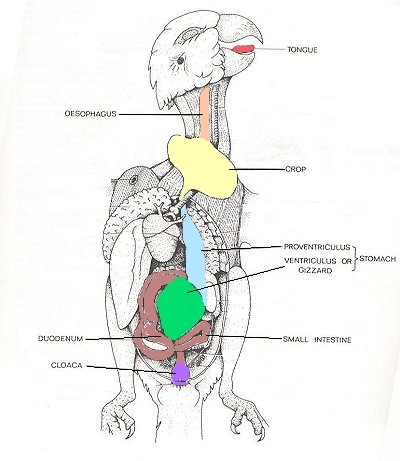 Below I have a diagram of the main parts of the digestive tract and a description of what happens to the food as it travels through your bird. Your budgie wakes up in the morning, does a yawn and one of those cute one legged, one winged stretches then hops over to have breakfast. Or the flock awakes in the grasslands of Australia and flits down to the ground to tuck into some yummy grass seeds. What happens to that breakfast? Budgie digestion starts with the beak and tongue (red on diagram above) when the budgie picks up a seed, manipulates it in its mouth and peels off the outer hull. Once that is done it swallows the seed and drops the hull. Once swallowed the seed travels down the oesophagus (pale orange) and into the crop (yellow). The crop is a storage facility, it does not digest the food. In the wild budgies have to eat while they can and may have to race off away from predators at any moment. If they had to chew each piece of food before eating the next they would probably go hungry. With a crop they are able to eat a lot of food without having to process all of it at once. They can fill their crop then fly off somewhere safe to digest their food at leisure. You can see your birds crop when it is full, it causes the lump on the front of your budgies chest, often sagging off to one side more than the other. The crop releases small amounts of food into the rest of the digestive tract to be digested. That means the bird can receive small amounts of energy and nutrients all through the day as required. As the food is released from the crop it passes into the proventriculus (blue). This is the first part of a birds stomach. This part of the stomach is glandular, meaning it has glands that release substances in to the stomach. It releases digestive juices to begin breaking down the food. It is also here that budgies produce 'crop milk', a liquid that is fed to baby budgies. So the food is now mixed with digestive juices and begins to breakdown. It passes out of the first part of the stomach and into the second part, called the ventriculus or gizzard (green). This is a muscular organ that crushes the food up with the digetive juices into a fluid mass. The gizzard contains pieces of grit that the bird has eaten to assist the crushing. There is some disagreement on whether budgie digestion requires grit. I will share my views but you will have to decide what you think is best for your bird! Birds that eat whole seeds rely on stone grit to crush up the seeds as the muscles alone struggle to do this. However birds that hull their seeds, like budgies, have less requirement for stone grit. I believe that grit should be available regularly but do not think budgies need it all the time. I know of budgies that filled themselves up with stones and died, so would suggest offering the grit once or twice a week for a day. To add to the confusion surrounding grit there are two sorts of grit to consider. The type used in the gizzard, and discussed in the previous paragraph, is insoluble grit. This is usually small peices of stone and cannot be dissolved in the digestive tract. As these pieces of grit are slowly ground up they pass through the budgie and are lost so do need replacing occasionally, hence the offering of stone grit every now and then. The second type of grit is soluble grit. This is usually pieces of crushed oyster grit, or similar. These are largely made up of calcium. They pass into the gizzard and are crushed over time, enableing the budgie to absorb the calcium. This is an important source of nutrients for your budgie and should be offered regularly, and at all times when breeding. Soluble grit is not suitable for crushing seeds like the insoluble grit and so is not a suitable replacement for stone grit. Anyway, now that we have digressed lets return to budgie digestion! The seeds have now been crushed up and thouroughly mixed with the digestive juices and are ready to pass into the small intestine (brown). The first part of the small intestine is called the duodenum. This is where extra fluids such as bile and enzymes are added to the food mix to assist digestion. These breakdown the food so that the proteins, fats, sugars etc can be absorbed by the small intestine and passed into the blood stream to be transported to where ever they are needed. Once this is completed the remains of the food are passed to the cloaca and out of the bird as droppings. You will notice your budgie has droppings with two parts. The brownish or green bit is the feaces, the unused food from the intestines. The white paste is uric acid, the equivalent of our urine. This is produced by the kidneys as they filter waste out of the blood stream, and passed down the ureter and to the cloaca. Birds have a very fast metabolism, to produce the energy they need to be so active and to fly. This means the food is passed through the digestive tract much faster than many animals, including us. A seed eating parrot like budgies can digest their food in about three hours. So that is budgie digestion, from tongue to cloaca in three hours!